You'd think there'd be flowers all over the place but we had to search to find them. 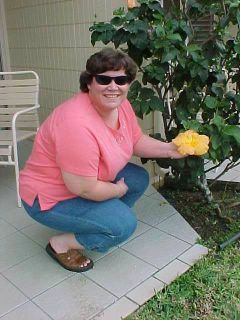 Here's Jean with the only orange flower on the hotel property. Veterans Memorial Park is located along the Arkansas River, a short walk from downtown. A combination of biking and walking paths lead around memorials from WWI to Operation Freedom. Below Operation Freedom. Passau was one of the stops on the revised cruise agenda. It’s a small town on the Austrian-German border. One of the more interesting areas is the Artist’s Alley. The resident artists are in charge of decorating the street and the theme changes. The current theme is trash and recycling. There are surprises around every corner and building. It's easy to miss the small sights when most of your attention is captured by either the buildings or the traffic. But look around and looking back is a snail queen. And these balancing men. Taking a selfie in the globe! Street entrance to the mosque. The Sultan mosque.